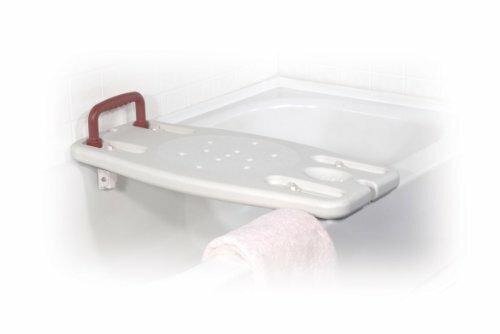 12023 Features: -Portable shower bench.-Material: Plastic.-One piece.-Adds convenience, comfort, and safety to the bathroom.-Handle provides additional safety and stability for the user.-Drain holes prevent pooling.-Sleek, slim, one piece design makes it great for storage or for individuals who travel.-Rubber stops on the underside of the bench will protect your tub and provide a secure and snug fit.-Latex free. Color/Finish: -Color: White. Dimensions: -Dimensions: 14.5'' W x 30.5'' D. Warranty: -Limited lifetime warranty.